How can I become an iKamper dealer? To become an official iKamper dealer, please go to our contact page. Where can I get Skycamp in the Australia? Visit our Dealers page for more information. Can the Skycamp be mounted on my car/truck? What kind of rack do I need? With their universal mounting system, iKamper rooftop tents can be mounted on most vehicles on the market. They are designed to be mounted on two normal cross bars (not directly on the roof of the car), such as ones from Rhino Racks, Thule, Rola, or any other after-market cross bars (same bars you would attach your bike or Kayak to). The cross bars should have a (dynamic) weight capacity of 75kg, and they should be at least 76cm apart. Please check the dimensions and mounting directions of the Skycamp HERE. The Skycamp can be mounted on a truck's roof or bed as well, and please check the dimensions above to see if it fits yours. However, some specific vehicles cannot have cross bars installed on the roof and therefore cannot have a tent mounted. Please keep the Skycamp's weight in mind (approx. 70kgs) when selecting a roof rack. How can 4 people fit in the Skycamp if my cross bars' weight limit is only 75kgs? Most cross bars and roof racks give their dynamic weight load, which is the weight they can carry when you're driving. i.e. if your cross bars have a dynamic weight load of 75kgs, you shouldn't put anything heavier than that on your bars when you're driving. Because other forces (wind, braking, bumps, etc) are at work when you're driving, the static weight load (weight limit when you're parked) is actually much higher than the dynamic weight load. How easy are your roof top tents to mount / unmount? Very easy! You can mount and unmount it using just one bolt spanner anytime you want. The weight of the Skycamp is only about (Skycamp 4X - 70kg) and (Skycamp 2X – 55kg) which is incredibly lightweight, considering its size when it is open. It can be loaded and unloaded by 2-3 people. The first time you mount the tent on your vehicle, it will take less than 30 minutes and once you get the hang of it, less than 10 minutes. How many sizes does the Skycamp come in? The Skycamp comes in two sizes (Skycamp 2X and Skycamp 4X, however the shells are the same dimensions, Skycamp 4X has the floor extension) that fits on most vehicles' roof racks. For the exact dimensions and mounting instructions, please click HERE. Can the Skycamp be mounted on a ute tray bed? Yes, it can. 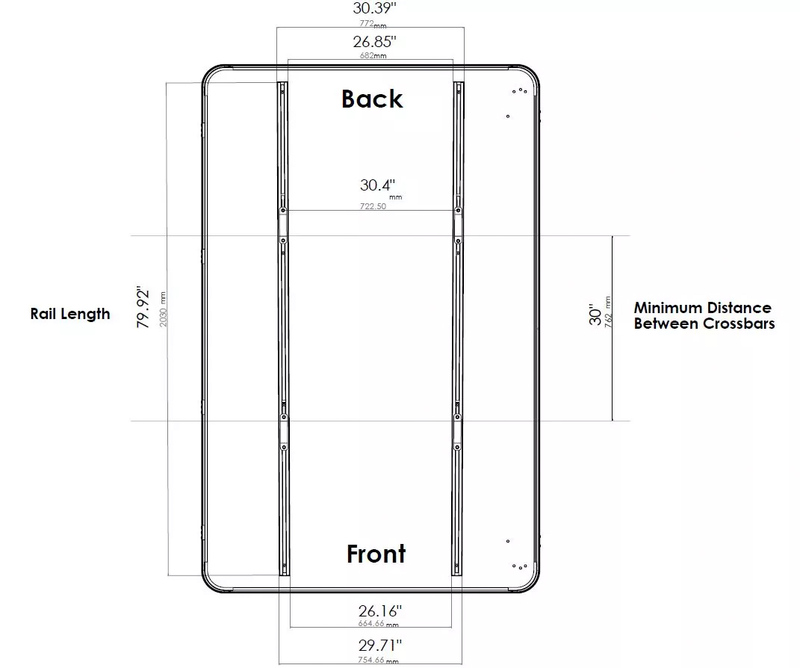 Please check our the Skycamp’s dimensions and mounting instructions. Please click HERE. What kind of rack/cross bars do I need to use for Skycamp? With their universal mounting system, iKamper rooftop tents can be mounted on most vehicles on the market. They are designed to be mounted on two normal cross bars (not directly on the roof of the car), such as ones from Rhino Rack, Thule, Rola, or any other after-market cross bars (same bars you would attach your bike or Kayak to). Check your vehicle's manual or contact manufacturer to know your roof's weight limit. Make sure your roof rack or cross bars have a dynamic weight load of at least 75kg. Your cross bars should be at least 76cm apart. Check the spacing of the Skycamp's mounting rails below to make sure it fits your rack. The rails are 4.5cm wide. Your roof rack and cross bars MUST have a dynamic weight load of at least 75kg, your cross bars MUST be at least 76cm apart, and your vehicle MUST have load limit over 75kg. Please consult your vehicle's manufacturer regarding the load limit, and please note that we do NOT recommend mounting the Skycamp on compact cars). Not following these instructions could not only damage your vehicle but could also cause serious injury. Will Skycamp fit on my car? Roof top tents are designed to be fitted on SUVs and other large vehicle (better performance and more visually pleasing). We recommend using our tents on larger vehicles, but there are a lot of roof top tents users with small sedans a well. There are several online forums dedicated to this. However, our tents should not be mounted on mini or subcompact cars. The main requirements are that your roof rack and cross bars have a dynamic weight load of 75kgs or more, and that your cross bars be at least 76cm apart.